Click on the area of the dog you would like to know about. 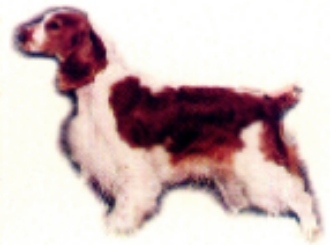 The Welsh Springer Spaniel head is unique and should in no way approximate that of other spaniel breeds. Its overall balance is of primary importance. The head is in proportion to body, never so broad as to appear coarse nor so narrow as to appear racy. The skull is of medium length, slightly domed, with a clearly defined stop. It is well chiseled below the eyes. The top plane of the skull is very slightly divergent from that of the muzzle, but with no tendency toward a down-faced appearance. A short chubby head is most objectionable. The neck is long and slightly arched, clean in throat, and set into long sloping shoulders. Topline is level. The loin is slightly arched, muscular, and close-coupled. The croup is very slightly rounded, never steep nor falling off. The topline in combination with proper angulation fore and aft presents a silhouette that appears rectangular. The chest is well developed and muscular with a prominent forechest, the ribs well sprung and the brisket reaching to the elbows. The tail is an extension of the topline. Carriage is nearly horizontal or slightly elevated when the dog is excited. The tail is generally docked and displays a lively action.